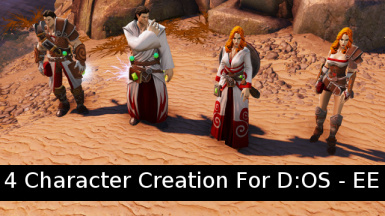 Play Divinity: Original Sin the Enhanced Edition with full party creation. This mod was created with help from Cadmus at Larian and Roguelike the creator of the original 4 Character Creation mod. This mod is largely untested and surely has some bugs. 1. Characters will not follow the party. 2. The third and fourth characters are not affected by surface status effects/damage. 1. You can still take the Lone wolf talent, you probably shouldn't though. 2. Characters 3 and 4 are still considered companions and should be expected to function as such. 3. As of Version 0.7.1.0 you can now dismiss and rehire the 3rd and 4th player. This means you can now recruit normal companions as well.